I know I have been MIA from posting much lately. I have been really busy with some large orders and life in general. Sorry, I have not been visiting your blogs daily and leaving comments but rather every few days. I think I'm caught up now and can get back to posting and visiting you all daily. While cleaning off my work table I ran across a few projects I never posted. So this morning I want to share this Sympathy card. The flowers are a watercolor image found on the internet. Beautiful card!! I can understand how Life can get in your way because that is how I feel right now. Just been babysitting for my two youngest grandkids twice a week for the summer. Not easy when they are so active and sometimes fight with each other. I love your beautiful card! !The flower image is gorgeous! !Stunning job my friend!! Hi Nana! I'm finally back from vacation! I had a blast & made some special memories with my boys! Glad to be home of course & hopefully get to craft this weekend! Just wanted to stop by & let you know I'll be back to checking out your blog again! :) Your card is wonderful.. such a pretty design! Have a wonderful day! What a lovely card! It was very nice talking with you today! You know why I have been MIA, Ruby came to visit (well her mom and Dad too)!!! We had such fun and I miss them so. I think this time of year a lot of people are missing from blog land. Very pretty, especially for such a sad occasion. This card is GORGEOUS!!!! Simply love it!!! Have a great day. That card looks very pretty. 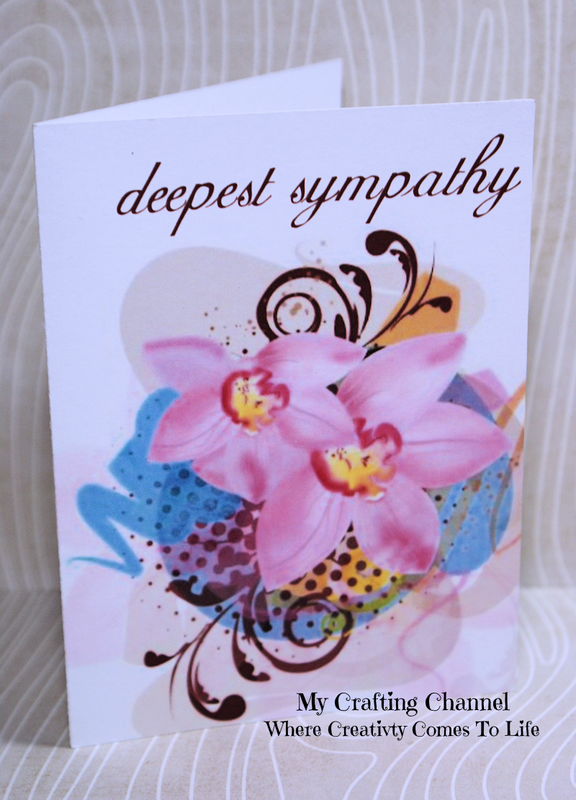 I think I can use this if there is situation when I have to show sympathy to someone. Thanks for sharing.